I consider it important to share with readers the basic elements of Russia’s real position on the situation in Syria. Unfortunately, British public opinion has formed a distorted view of Russia’s approach to the current political crisis in the country with which we have long-standing bonds of friendship and whose fate is not a matter of indifference to us on either state or human levels. First of all, I would like to make it clear that Russia categorically condemns any violence. The actions of President Bashar Assad’s government throughout the crisis can hardly be called exemplary. The perception that Russia is “blindly supporting” the Syrian authorities is mistaken. However, it is worth remembering that about 25–30 percent of those who died in Syria are members of the security forces. It is therefore wrong to say that government tanks and artillery in Syria are confronting poorly armed civilians. Several dozen law enforcement personnel die in Syria every week as a result of terrorist attacks. Seeking to stoke up tensions, the opposition fighters disrupt the power and water supply, and the work of shops, etc. During the recent showdown in Homs, civilians were practically hostages to the irreconcilable position of the two sides. Therefore, we believe it is crucial that the international community condemn not only the violence on the part of government forces, but also the armed actions of the opposition; that it demand the political opposition dissociate itself from extremists; and that the armed opposition groups leave population centers in conjunction with the withdrawal of government forces. This was the aim of the Russian amendments to the draft resolutions of the UN Security Council and the General Assembly. Unfortunately, these ideas were not supported by many of our UN partners. We are convinced that a one-sided condemnation of the Syrian government and its diplomatic isolation, coupled with unconditional support for the opposition, are not conducive to peaceful settlement but instead encourage the opposition to continue its armed struggle instead of seeking political methods. Our Western and some Arab partners are effectively taking one side in the internal confrontation, whereas the real goal should be to assist the Syrian people in independently deciding their own future through political and not revolutionary means. It is well known how long it took for the political situation in France to return to normal after the 1789 revolution. Perhaps in England it took less time – 50 years – to achieve a settlement in the form of the Glorious Revolution. Neither the Enlightenment, nor the European revolutions could protect Europe and the world from the catastrophe of World War I. Why not help others avoid such a bloody path and carry out transformational processes by evolutionary methods? It is important to understand that President Assad still has the support of a significant portion of Syria’s population. The high turnout and the results of the vote on the referendum for the new constitution, for all the flaws of holding a referendum during such an unstable period, have demonstrated the Syrians’ desire to seek a political solution to the crisis. To continue to inspire the opposition to overthrow the government militarily is irresponsible with regard to all the citizens of Syria, irrespective of their political views. Judging from reports in the British media, the opposition claims that the Western countries first provoked them to launch an armed struggle and have now “abandoned” them. Russia is working with Damascus on the diplomatic front in order to induce the Syrian authorities to begin a dialogue. It is not easy to achieve results, because any government would find it hard to agree to negotiate with people who openly call for its overthrow. Nevertheless, we have secured the Syrian government’s agreement to have such a dialogue. In contrast, the opposition, including the Syrian National Council, has rejected it. 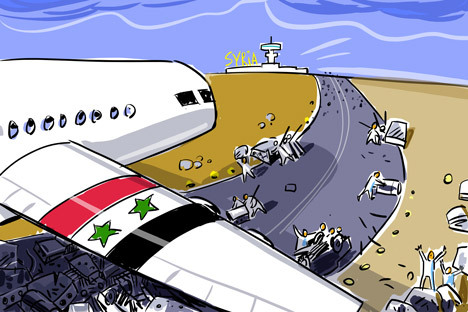 The whole international community is interested in averting civil war in Syria. Russia knows only too well what civil war is from its own tragic experience. To that end, it is necessary to exert every effort to launch an inclusive political process in Syria, involving both the authorities and all the opposition groups. One of the key conditions for that is restoring confidence, including between Russia and its Western partners, which was seriously undermined by NATO’s military operation in Libya. Some episodes in the Syrian situation also tend to erode confidence. They include the hasty vote on the afore-mentioned draft UN Security Council resolution, ignoring our mediation efforts while Western journalists were evacuated from Homs, and so on. However, we see that responsible politicians and diplomats are leaning more and more towards the need for a political settlement. That chance should not be missed. One way to restore confidence and create conditions for a full-fledged dialogue is, for example, coordinated work to relieve the humanitarian situation in Syria. We hope that the Security Council will be able to pass a resolution to that effect. This could provide the basis for further interaction. I am convinced that chances to avoid a civil war and help the Syrians overcome the current difficult situation exist. The main thing is to seek not to bring about a “correct” result predetermined by someone else, but to create conditions in which the Syrians themselves can work it out. One may argue that we are advocating for a “soft landing” for the regime, but in fact it is about a “soft landing” for Syria and all Syrians, and obviously for the whole explosive region. Alexander Yakovenko is the ambassador of the Russian Federation to the United Kingdom.